North Down is booming with great eateries and bars. You can sample flavours from all around the world, or know you are in good hands when it comes to good old-fashioned pub grub and Northern Irish classics. With so much choice, how do you choose where to go for a meal or a drink out? 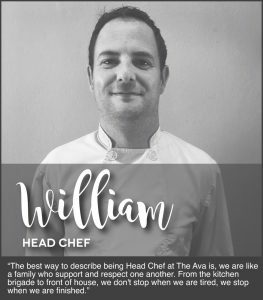 The Ava’s Head Chef, William Dawson, and his team have put together an inclusive menu delivered daily by his team. It caters for all types of dietary requirements, preferences and allergies, and if the dishes aren’t already, some can be made to be vegan, vegetarian or gluten free. Next time you’re in always check the guide at the bottom of the menu and speak with a member of staff before ordering. Located in a seaside town it only makes sense to have fresh fish, mussels and prawns as menu staples, while also showcasing seasonal produce like lobster, crab and swordfish. Seafood not your style? The Ava Winebar offers a Steak Night deal every Thursday and both floors now offer a hot volcanic cooking stone experience, allowing customers to cook their very own fillet or sirloin at their table. The Ava are famous in Bangor for their Sunday Roasts, for taste and value for money with the popular two course priced at just £11.95. The food offering doesn’t stop there, with the Winebar and Bistro also serving a daily Tapas Menu, perfect for a light nibble or to share. It’s no secret that the Gin BOOM has well and truly hit Northern Ireland, however this North Down eatery goes that extra mile. The Ava LOVES gin. They not only offer a wide selection of garnish and range of premium and local gin in their impressive back bar, but they also create their very own ‘Monthly Gin Fusion’ a concept created and lead by Bar Manager, Felipe. This summer the venue introduced premium Bombay Boards, a popular option for customers who fancy a gin and a light nibble. The deal comes with two Bombay Gin Goblets and two ‘nibble’ dishes served on a custom board for £10. Going out to eat or drink doesn’t have to break the bank or make you squeeze your purse strings, and with The Ava’s daily offers and promotions it’s easy to see why. something for everyone with The Ava Winebar Week! Feed the Family in The Ava Bistro every Thursday! Meet the rest of The Ava Team here! 5. don’t forget the cocktails! Felipe and Theo’s speciality! Of course, The Ava’s Classic cocktails like the Cotton Candy Fizz, Bounty Daiquiri and Liquid Gold need a mention! Check out the new Drinks Bible for their full range of vodka, gin, rum and prosecco cocktails here. Kids are welcome seven days a week from 12-9pm at The Ava. More often than not you can find some of our serving staff fussing over babies and bringing colouring sheets and toys to tables. There is a full kids menu, including baby bowls for the toothless kind. Have a picky eater in the family? No problem, staff will always try their best to accommodate. Oh, and don’t forget their family themed dining evening in The Bistro! Whether it’s a wedding anniversary, first date or birthday, The Ava will always make your special occasion memorable. No request is too small, got a birthday cake? Deliver it before your table arrives and the team will endeavour to bring it out with a fuss, song and sparkler. Organising an intimate dinner, large party or corporate event? The Ava also have Private Hire options which include entertainment, food and drink packages. Every weekend at The Ava you will find 3 floors buzzing with entertainment. The Winebar showcases local live bands and solo artists, such as Cap on the Wall, Cut n Two, Gavin Ferris and the 3 girls. Resident Wayne Carr performs every Saturday evening in the Bistro while the Pit hosts karaoke and live solo acts on Friday and Saturdays. During the summer months the building isn’t the only thing that buzzes, DJs liven up Main Street with their afternoon sets in the Wine Terrace. Ideally located beside Bangor’s Bus & Rail Station, The Ava complex is easily accessible by public transport. Whether you’re in need of a quick pit stop before heading to Belfast or coming into Bangor for the day/evening, The Ava has what you’re looking for. Factors such as music, lighting, heating, table layout and personalised service are all carefully thought of to achieve a comfortable and intimate setting for guests. 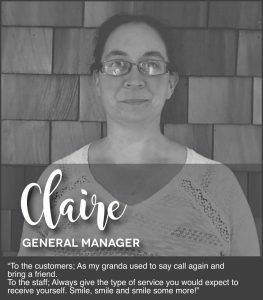 Customers also amplify and contribute to the atmosphere with table chat, celebrations and the clinking of cutlery and glasses. Has The Ava Blogger managed to sway your decision on your next eatery or watering hole?